Today we have released a new video in the Videos Section that shows the Course Forge Course Converter being used to import a section of the world from Bing Maps into Course Forge as a terrain. 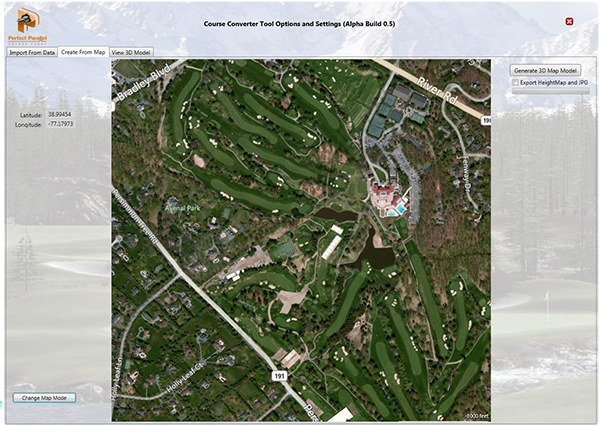 This feature will make it easy for anyone to browse to their desired golf course in the world and import whatever terrain data Bing have available and import it as a heightmap and perfectly aligned overhead view. Simply run course converter and navigate to the Create from Maps tab and then zoom in to any place in the world using the map based interface. Once you have identified the part of the world to import click the Generate button and wait for it to download the data. If selected at the end of the process you will be prompted to save a jpg file which is the image, the XYZ file which is your ascii grid and a heightmap file. The heightmap file and jpg can then be imported directly into Unity and Course Forge. Oh wow this is spectacular. This is going to make designing real courses so much easier and more realistic. Very exciting stuff! That video was neat as far as importing terrain into Unity but what is the next step in creating a golf course with the terrain? Is the terrain import we saw port of Unity itself or specifically part of Course Forge? How "dramatic" do the heights have to be to show up on these import maps? I am interested in recreating a golf course that is local to me - will these data maps contain the sublet heights already built into that golf course? 10metres I think I've read. Course Forge is our golf course tool set that sits on top of Unity. At its base is the unity terrain. awesome guys, very excited about all this , bravo . Andy, is the converter a stand alone or part of tools included in Forge. I would like to experiment with the use of bing maps as terrain models using tthe converter, but i'm guessing it's not available yet? We have built it as a standalone because it uses .Net 4.5 and Unity does not allow that so it could not be a part of course forge.